I am a game theorist studying peoples’ behavior in dynamic situations. In particular, I study learning behavior in different market and non-market situations through theory and empirics. 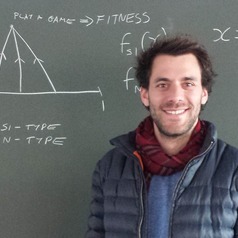 Currently based in Zurich, I am a postdoctoral researcher at ETH Zurich in the Computational Social Science group. I am also an associate member at the Oxford-Man Institute of Quantitative Finance. My DPhil at the University of Oxford was a theoretical study of decentralized market places (such as eBay or Amazon) and peoples' behavior on such markets. In addition, I am now also working on understanding processes of opinion formation and resulting dynamics such as polarization.